rec. 22, 26-29 June 2016, Pásti Synagogue, Debrecen and Hungary. This CD, the first in a projected series of three, rescues from obscurity the music of the English composer, conductor and pianist, Henry Cotter Nixon. His name was completely new to me and it may be similarly unfamiliar to others so some brief background information is probably in order. For this I draw on the very thorough and interesting booklet notes. These are by David J Brown, who covers Nixon’s biography, and by Paul Mann who writes about the music itself. I should record my thanks to David Brown who has very kindly supplied me with additional background information. Paul Mann’s notes on the music are absolutely indispensable and I found invaluable his description of how the music unfolds in Palamon and Arcite, relating the music to the story. I’d recommend all listeners follow along with his notes. Nixon was born in Kennington, South London. His father, Henry George Nixon (1796-1842) was both a composer, mainly of liturgical music, and an organist. Though an Anglican, Nixon père worked as organist in a number of prominent Roman Catholic churches, serving finally in the church which in 1852 would become the Roman Catholic cathedral in Southwark, London. By then, however, Nixon was dead, a victim of cholera. His early demise put his family into financial difficulties and perhaps this explains in part why young Henry was sent as far away as Hull to receive musical education from a family friend, Dr Harry Deval; perhaps Deval was considerate in the matter of fees. Following in his father’s footsteps, Henry secured a post as organist in an RC church in Hull – he would subsequently serve other Catholic churches. Nixon’s grandson, Anthony, of whom more in a moment, has suggested that both his grandfather and great-grandfather were attracted to making music in Catholic churches by a “love of the then florid form of RC church music”. It would seem that Henry Cotter Nixon, besides playing the organ and violin, became a pretty useful pianist; in due course he performed concertos by composers such as Beethoven, Mendelssohn and Weber. For reasons of health Nixon moved from London to Sussex in 1872. There he pursued a successful career as an organist, teacher and conductor; he also married. For twelve years from 1876 he was conductor of the Hastings and St Leonards Orchestra and seems to have done a noteworthy job there. Around 1889/91 he returned to London and rather faded from public view although he continued to compose. However, his final years were affected by tragedy. His wife died from cancer in 1895, three years after the couple had suffered the loss to diphtheria of their thirteen-year-old son. Nixon’s last known work is a Coronation March (1902), which was completed only in piano score. That Nixon’s music has survived at all, albeit unperformed for many years, is down to the efforts of his family and especially his grandson, Anthony Nixon, who conserved the manuscripts, catalogued them and in 1993, six years before his own death, donated the collection to the Library of the Royal College of Music. An encounter between Mr Nixon and David Brown in 1991 at the annual general meeting of the Havergal Brian Society was an important step along the road which led to the present recording. Of the three works here recorded – all for the first time – easily the most substantial and ambitious is the Symphonic Poem, Palamon and Arcite. We are told in the booklet that Anthony Nixon caught David Brown’s attention at their first meeting by claiming that with this score his grandfather had composed the first British symphonic poem. David Brown indicates in the booklet that, in fact, this claim was not entirely accurate. The scoring calls for a conventional Romantic orchestra consisting of pairs of flutes, oboes, clarinets and bassoons, four horns, two trumpets, three trombones, timpani and strings. It appears that prior to this recording the work has achieved only one complete performance. That took place at a concert in 1888 at which the Hastings and St Leonards Orchestra marked Nixon’s retirement as their conductor. A projected 1993 BBC studio recording by Adrian Leaper and the BBC Concert Orchestra was not completed for reasons detailed in the booklet. The story concerns two cousins, Palamon and Arcite, who are taken prisoner after a battle against the army of King Theseus of Athens. From his cell Palamon catches sight of Princess Emilie, the stepdaughter of Theseus, and falls in love with her. Unfortunately Arcite sees her too and is equally smitten. I’m not entirely clear at what point the cousins realise they are rivals for the princess; I suspect it may not be until midway through the fourth movement. A mutual friend makes interest with King Theseus and secures Arcite’s release from prison though he is sent into exile. In The Dream he is inspired to return to Athens to attempt to win Emilie, even if it should cost him his life. In Encounter and Combat he meets Palamon, who has escaped from gaol. They fight over the princess. Theseus intervenes, stops the dispute and orders them to go away for a year and then return with 100 knights each to compete in a tournament: the winner gets the girl. In passing, I wonder why Theseus is so lenient with them: one has returned without permission from exile; the other is a fugitive from prison. Arcite’s side wins the tournament but in the moment of victory he is thrown from his horse and fatally injured. As he dies he is reconciled with Palamon whose union with Emilie then furnishes the tale with its happy ending. As Paul Mann points out in his essay about the music Nixon “entirely avoids sonata structures in the strictest sense” in this score. I’m sure that’s right. However, having listened to this work several times a few things strike me particularly. One is that Nixon gives himself structural – and narrative – unity by revisiting some of his themes at appropriate points as the story unfolds through the music, even if he doesn’t quite treat the themes as leitmotifs. Another is that Nixon has a genuine melodic gift - the theme that is associated with Emilie is especially winning. Above all, however, I’m struck by the assurance with which Nixon handles the orchestra in a work of such length. Granted, he doesn’t use any exotic instruments but within the limitations of a fairly standard orchestra he demonstrates a fine feeling for instrumental colour and it seems to me that Palamon and Arcite is very well laid out for orchestra. I wonder how this talent was developed. He did have practical exposure to an orchestra as conductor of the Hastings and St Leonards Orchestra from 1876 but so far as I’m aware he didn’t have any formal tuition in orchestration, unless it was from Dr Deval in Hull. I can only surmise that he learned his orchestral craft partly by taking part as a violinist in orchestral concerts in London - and also, perhaps, by attending other concerts as an audience member. Probably he deepened his knowledge by studying some scores, and his practical work directing the Hastings orchestra was probably crucial. However he learned his craft, this symphonic poem shows a composer with a genuine talent for orchestral scoring. More than once in his commentary Paul Mann mentions that the orchestral writing is demanding on the players. As to influences on his music we can hear clear echoes of Mendelssohn in Palamon and Arcite. I also detect traces of Schumann and Brahms. The ‘blurb’ on the CD jewel case also refers to the programme symphonies of Goldmark and Raff but I must admit to insufficient familiarity with their works to be able to comment one way or the other. In the first movement Paul Mann mentions “brooding” opening bars and “a sense of dark foreboding” as Nixon sets the scene on the night before the battle. I don’t quite hear these things – though Mann knows the score intimately and I don’t. What I do hear is a lot of darkly lyrical writing, though. When battle is joined (5:00) the music bursts into life and successfully depicts conflict. As Paul Mann says, there’s more than a hint of Mendelssohn’s overture to Elijah at this point. On the command of Theseus the fighting ceases and the first movement subsides in an uneasy calm. Emilie is the longest movement but before we encounter her our heroes are seen in prison. Mann rightly draws attention to a striking – and difficult - passage for the four horns (1:59-2:40) which depicts the bond between Palamon and Arcite. When Emilie is seen, first by Palamon, we hear her theme on the clarinet (5:28). There’s increasing ardour in the music and by the time this ardour peaks (around 8:00) the parallel that Mann draws with Tchaikovsky is not inappropriate. The horn episode is reprised (10:06) and Mann points out a telling device: the horns’ music is decorated – or gently disrupted – by flutes, suggesting that what I might term womanly wiles have the potential to come between the cousins. In The Dream Arcite is now in exile. At 3:10 there’s a determined passage for brass and I wonder if this illustrates his resolve to return to Athens to win Emilie. There’s a definite debt to Mendelssohn in this movement, not least in the closing bars (from 7:16). The opening pages of Encounter and Combat depict the reunion between the cousins on Arcite’s return to Athens. I can only surmise from the relaxed and carefree nature of the music that at this point in the tale Palamon is unaware that he has a rival for Emilie’s affections; the music is decorous and civilised. However, at 5:20 there’s a very sudden eruption of minor-key music as the cousins fight over the princess. Their dispute is halted (7:20) by the command of Theseus. A year later, as instructed, each cousin returns with his troupe of followers for The Tournament. Horns and other brass instruments are to the fore in depicting the bustle and pageantry and as the jousting gets under way Nixon skilfully uses dotted rhythms to impart energy into his music. The death of Arcite (3:45-5:40) is marked by music of genuine pathos. The last couple of minutes are celebratory in tone as Palamon and Emilie prepare to live happily ever after though Nixon interrupts the revels very effectively just before the end (7:15-7:48) with one last, gentle reprise of Emilie’s theme on the oboe with horns quietly pulsing underneath. The ending is brief and exultant. I’ll defer a verdict on this substantial symphonic poem until I’ve considered the other two works on the disc. Jacta est Alea is the third of Nixon’s three concert overtures. The title means ‘the die is cast’ though, at the risk of seeming pedantic, I think the correct Latin rendition should be ‘Alea jacta est’. The phrase is said to have been uttered by Julius Caesar after he had led his troops across the Rubicon to march on Rome in 49 BC. Nixon’s music rather belies the title – and its historical origin. One might expect deeply serious music but such is not the case. The overture is essentially a sonata-form composition though, as Paul Mann tells us, Nixon throws in a few surprises along the way such as an unexpected switch to 3/4 time for the coda (from 11:59). The piece begins with a slow, rather Brahmsian introduction. The pace picks up at 2:16 with an allegro first subject that Mann very aptly describes as “tautly decisive [and] vigorously determined”. This is spirited stuff, full of energy and very positive in tone. The second subject (from around 5:19) is genial and good-natured; here the woodwind are well to the fore. There is a short, turbulent development section but geniality is soon restored and essentially the overture is good-humoured. An ebullient coda concludes what I think is a happy piece. The Romance for Violin and Orchestra has been reconstructed by Paul Mann from the orchestral parts. Nixon himself was a violinist and he writes here with great affection for his own instrument, exploiting its cantabile potential most effectively. As Paul Mann says, the piece mainly “unfolds in an unbroken stream of romantic lyricism”. The Romanian violinist, Ana Török plays the solo part most attractively and she’s supported by a nicely-spun accompaniment which Paul Mann and the orchestra deliver with no little sensitivity. I enjoyed the Romance very much. It’s a delightful little piece and here it receives a winning performance. 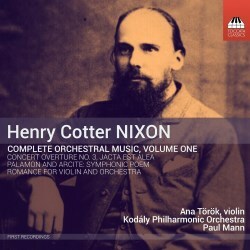 So, what are we to make of Henry Cotter Nixon and especially his magnum opus for orchestra, Palamon and Arcite? I don’t think we’ve uncovered a lost masterpiece here but it’s a very well written and attractive score that is well worth hearing. I’ve enjoyed getting to know it very much and there’s a great deal to admire in it. As I’ve indicated already, Nixon wrote fluently for the orchestra. What I think lets him down in the last analysis is that his imagination was either insufficiently vivid or was too controlled. By coincidence, at the same time that I was absorbing this disc I was also evaluating a new recording of Smetana’s Má Vlast. Now, Má Vlast is not without its weak pages but essentially it’s a fervent, strongly-profiled composition. Palamon and Arcite, for all its merits, doesn’t have the same air of burning conviction that grabs the listener’s attention. I wish that Nixon’s score had exhibited a bit more red-blooded passion or, in the battle and jousting scenes, rather more in the way of drama. Having said that, however, I repeat that Palamon and Arcite is well worth hearing, as are the other two works on the disc. It’s hard to imagine that the music could receive better advocacy than Paul Mann and the Kodály Philharmonic Orchestra offer. The playing is never less than committed and assured and Mann, who also acted as producer of the disc, has clearly prepared the performances scrupulously and out of conviction. The recording engineer, Zoltán Osváth has done a fine job, presenting the performances in excellent, realistic sound. As I’ve already indicated, the documentation is first-rate; the notes are an excellent example of how unfamiliar music by an unknown composer should be presented. The other two volumes in this Nixon series are already ‘in the can’ and I look forward keenly to hearing them.